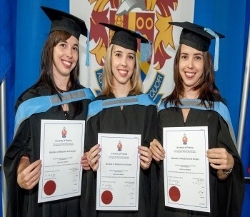 Triplet sisters Elana, Carla and Marli van Heerden graduated together as medical practitioners at the University of Pretoria’s autumn graduation ceremonies. The sisters were born in Pretoria and matriculated from Helpmekaar College in Johannesburg in 2006. Each of the sisters obtained seven distinctions. In 2007 they registered for the Bachelor of Medicine and Surgery (MBChB) programme at the University of Pretoria. They spent six years living together at the University’s residence Huis Carlitzia, the University’s only female residence which accommodates all the Health Science students. The sisters attribute their success to hard work and commitment, as well sharing ideas and supporting one another. Elana van Heerden started her internship at Groote Schuur Hospital in Cape Town. Carla is doing her internship at Charlotte Maxeke Hospital in Johannesburg, while Marli is at Kalafong Hospital in Pretoria. All three sisters agree that it is too early to identify a preferred speciality. The graduates’ parents, both of whom studied at the University of Pretoria in the 1970s, currently live in Randburg. Mrs Sanette van Heerden completed a Bachelor of Education and Mr Piet van Heerden completed a Bachelor of Science in Information Technology. Mrs Van Heerden said she is very pleased with her children’s achievement and regards them as good students who were committed to their school work and are self-motivated. The Dean of the Faculty of Health Sciences at the University of Pretoria, Prof Eric Buch, congratulated the group of over 200 medical doctors who graduated this year. He further commented on the extraordinary circumstances of the triplet medical students, how each was accepted on her own merits into the University’s medical school, and how they studied and graduated together. ‘The University’s medical school ensures high quality standards which are not being compromised. The triplets have done well and have kept up with those standards,’ said Prof Buch. He added that the University of Pretoria’s Faculty of Health Science has responded to the call by the national Minister of Health, Dr Aaron Motsoaledi, to increase its output to an additional 160 medical doctors. Prof Buch also expressed his appreciation for the academic staff who could have gone into private sectors to earn larger salaries, but instead opted to contribute to the community by producing quality healthcare professionals.